Second, some forms of radiosurgery require rigid head-frames that are screwed into the patient's skull to minimize any movement. The CyberKnife System does not require such extreme procedures to keep patients in place, and instead relies on sophisticated tracking software, allowing for a much more comfortable and non-invasive treatment. And finally, the CyberKnife System's treatment accuracy is unrivaled. 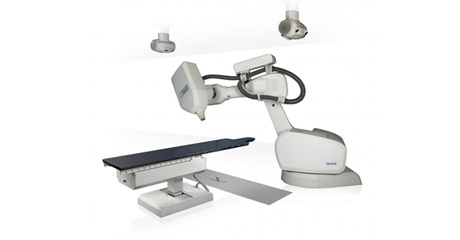 Its ability to treat tumors with pin-point accuracy is unmatched by other radiation therapy and radiosurgery systems. The CyberKnife System can essentially "paint" the tumor with radiation allowing it to precisely deliver treatment to the tumor alone, sparing surrounding healthy tissue.